It’s time to get out there and get going! Please consider a new year’s resolution to join old friends or make new friends at one of our upcoming rehearsals. Men continue to meet on Mondays at 6:45 and Ladies are singing every Thursday at 6:45PM. If you’re already singing with us, you will be able to download new music for both Men and Ladies from our website. 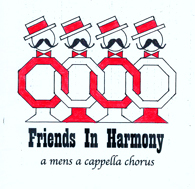 Men have a sing out on the 18th and an installation dinner on February 1st. Check out our website for the calendar and directions.